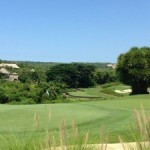 Bali National Golf Club, arguably now the flagship of Bali golf, following a complete redesign by Nelson, Haworth Golf Course Architects and reconstructed to international standards over the past one and a half years, officially reopened on 1 March 2014, with spectacular views over the majestic backdrop of Gunung Agung and the Indian Ocean. Your new golf journey commences amidst a lush tropical forest set on hilly parkland and then it’s on into spectacularly landscaped coconut groves, before arriving at the penultimate par 3, 17th hole, where a golfer’s question may well be “where’s the fairway”! 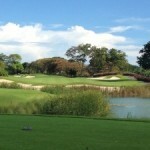 Yes, this hole requires a precise tee shot to a magnificent island green. Bali National Golf Club is managed and maintained to world class standards by IMG, the world’s largest sports marketing and Management Company. 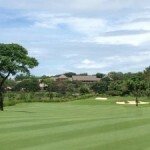 At this course, using buggy is mandatory and all golfers will accompany by a Balinese caddy each. At the lobby have a pro-shop which offering a golf club rental as well as shoes and many other golf amenities. If you are coming earlier before the T off time set, you can rent a space to practice putting and chipping at the green area that is close to the lobby. Changing room or Locker room is well maintained with luxurious amenities as just like 5 stars hotel. Welcome and try this new course now!